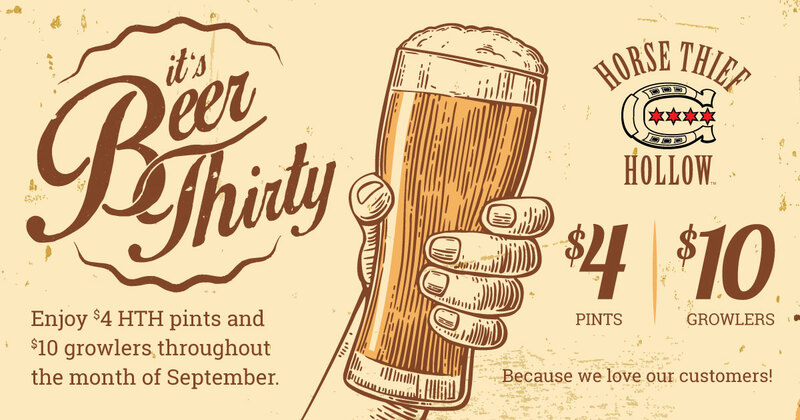 It's Beer Thirty all Month Long! It’s Beer Thirty all Month Long! 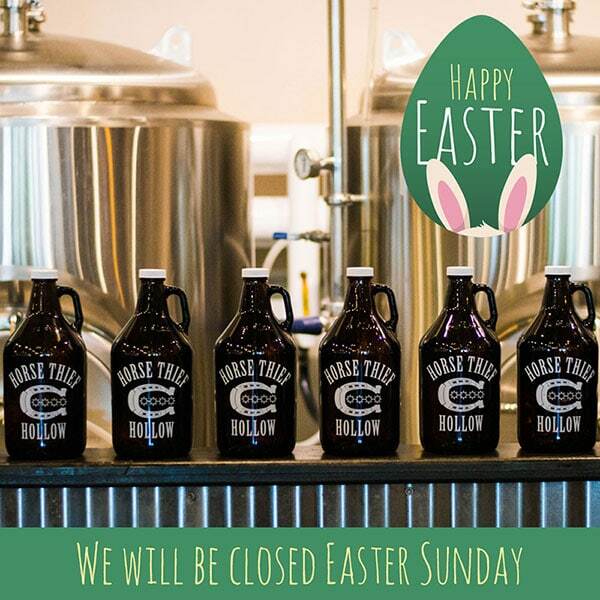 Did we brew too much beer at Horse Thief Hollow last month? Do we love our customers? Is it Beer Thirty yet? We did, we do, and it is. A refreshing, unfiltered German ale, 18th Rebellion has a lemony, slightly sweet nose and peppery finish. This Kolsch style ale is carefully fermented to be light and crisp, and it received a Bronze medal at the 2014 Great American Beer Festival. ~ 5.0% ABV, 20 IBU. 16 oz pint. An American Pale Ale, born out of friendship and humor. Why is it called Kitchen Sink? Because it’s made with a collage of hops from around the world, blended with a copper colored malt profile and a touch of Rye. ~ 5.7% ABV, 45 IBU. 16 oz pint. This American style India Pale Ale (IPA) has a pine and citrus hop profile and medium copper body. If you like strong, bold, and hoppy, Annexation Ale is for you. ~ 7.2% ABV, 40 IBU. 16 oz pint. Brewed to celebrate our in-house roasted coffee, this Oatmeal Coffee Stout has a smooth dark body and three additions of coffee flavor: roasted barley, cold-brew coffee that’s added post-fermentation, and a coarse ground “dry hop” finale. ~ 3.8% ABV, 28 IBU. 16 oz pint. This Düsseldorf-style German Alt brewed with local Wild Blossom Honey ~ 6.3% ABV, 40 IBU. 16 oz pint. Our refreshing Weiss beer blended with fresh lemon juice, zest, and lemonade. 5.1% ABV, 17 IBU. 16 oz. Weizen glass. Are you still reading? Stop–it’s Beer Thirty already! Filed under Neil's News, Promotions.